Where in the world would you find a transatlantic journey that once offered a lounge, a formal dining room, a white linen table setting for up to 35 passengers, a menu of shrimp cocktail, turtle soup, steak, fresh vegetables, peach Melba, and a wide choice of drinks? This was not a transatlantic cruise, because ships took seven to nine days to cross the ocean. No, this was a transatlantic flying boat, which in 1939 took 25 hours and 40 minutes to fly one way. 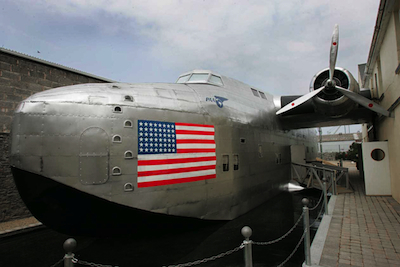 Today you can relive the era at the Foynes Flying Boat Museum at the actual site of the original terminal, located 21 miles west of Limerick city in Ireland. This was the European center of transatlantic civil aviation up to 1945, and an important strategic site during the years of World War II. Flying boats were exciting aircrafts in those early days and one of them, the Yankee Clipper, flew from New York to the town of Foynes on the Shannon River estuary, with stops in New Brunswick, Canada, and Newfoundland while carrying a crew of 12 including two pilots, a purser, chefs, and service personnel. The once famous Yankee Clipper made its maiden passenger transatlantic flight in 1939, some 20 years after the first non-passenger flight by the famous British aviators Alcock and Brown. The design engineers based their drawings on ship designs allowing for takeoff and landing on water, as there were only a few small runways in Europe during the 1930s and ’40s. 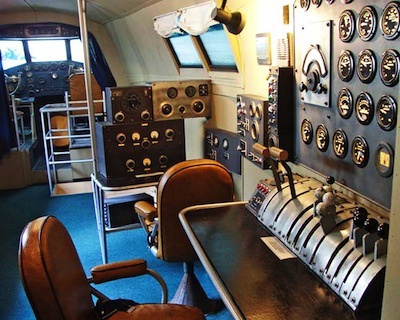 You can step on board a splendid replica, which was meticulously rebuilt from drawings supplied by The Boeing Company, and sit in the captain’s chair as you reach for the throttle and check the dials. Late one winter night the Yankee Clipper took off on a scheduled flight from Foynes heading west, but after several hours into the flight conditions turned so bad over the Atlantic that the captain decided to turn back. A Morse code message was sent to advise Foynes of their return. The staff was called back to the terminal to prepare for the returning cold and weary passengers, and chef Joe Sheridan added some Irish whiskey to their coffees to warm them up. “Hey, buddy,” said a grateful but surprised American passenger. “Is this Brazilian coffee?” “No,” said the chef, “that’s Irish coffee!” And the name and the recipe stuck to become one of the most famous after-dinner drinks in Ireland and around the world. Most passengers during WWII were senior military and diplomatic personnel traveling under false passports for security reasons and were instructed to keep their travel plans to themselves for fear of enemy ears learning sensitive information regarding movements of military personnel. On the museum wall you will read of a wartime security notice instructing all BOAC ground crew to keep their travel plans to themselves. Ireland (called Eire) was a clever place to locate this terminal because it was officially neutral during the war. This quality museum evokes romance and intrigue, reflecting an era of tense geopolitical times which contributed to shaping much of the western world as we know it today. If you would like to purchase this article for your publication, please click here to contact the author directly.